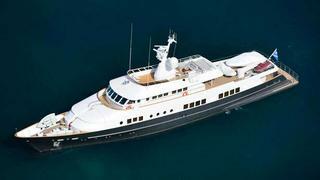 The 44.68 metre motor yacht Berzinc, listed for sale by Toby Maclaurin at Ocean Independence, has had a €2.45 million price cut. Berzinc was built in steel and aluminium by Spanish yard Astilleros de Mallorca to a design by Camper & Nicholsons and launched in 1977. She spent the years from 2004 to 2007 at the Balk Shipyard in Holland, during which time she was sand blasted back to bare metal, internally gutted and comprehensively rebuilt from the hull up, working in partnership with naval architects Navirex and designer Felix Buitendijk. The hull was lengthened, she was fitted with a new keel and a new flybridge was also built. Berzinc's interior styling features dark wood floors contrasting with an all-white decor, and she accommodates 12 guests in five staterooms. These consist of a master suite, two double staterooms and two twins with Pullman berths and all staterooms have en suite bathroom facilities. There are also flat screen televisions throughout. Twin 1,050hp MTU engines give Berzinc a range of 3,500 nautical miles, and she is fitted with zero speed stabilisers. Lying in Genoa, Berzinc is down from €6.25 million to €3.8 million.